Use instructions below for a self directed walking tour of a West Texas town that's more than a century old. Follow in the footsteps of the builders of the frontier that made Abilene what it is today. Created by the T&P Railway, Abilene rose from the prairie to become a vital center of activity in West Texas. Abilene began when lots were sold at auction in 1881. Oil strikes and record harvests led to unparalleled prosperity in the 1920s, the decade in which many of the buildings on this tour were constructed. Now the home of three universities and a large air force base, Abilene, a leader in the oil industry, serves as the medical, shopping and cultural hub for this area of the state. Enjoy the efforts of Abilene's recent downtown revitalization, which has become a model for other communities interested in preserving their heritage. 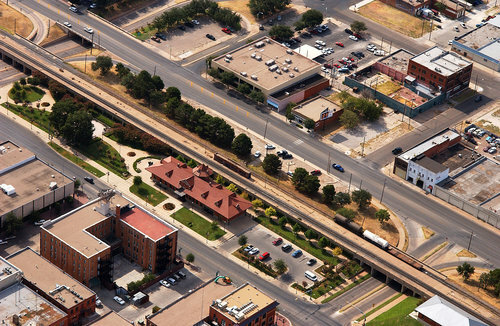 The Abilene Commercial Historic District, created in 1991, preserves the unique architecture and cultural landscape that developed from Abilene's position as the regional trade center. Begin your tour by walking west from Frontier Texas! down North 1st St. until you reach the first building on the walking tour, the T&P Depot (see map of Abilene Historic Downtown Walking Tour). 1. 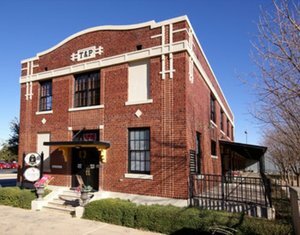 T & P Depot - 1101 North 1st St.
One of Abilene’s most outstanding landmarks is the Texas & Pacific Railroad Station that was built in 1910. The last passenger train left the Depot in March 1967 with only 39 passengers aboard. Its exterior was restored in 1994 to its 1920s appearance. 2. REA Building - 1201 North 1st St. Located to the west of the Depot, the REA building was built in 1936 to house Wells Fargo Express. Next it housed the American Railway Express Co., followed by the Railway Express Agency Inc.
3. Concrete Overpass - 1100 to 1200 Blocks North 1st St. This long concrete overpass and retaining wall was built in 1936 by Austin Bridge Co. of Dallas as a WPA project. The structure, extending from Pine to Cedar streets, was constructed to ease traffic flow near the railroad and boost the local economy during the Great Depression. The automobile underpasses built on the Pine and Cedar street crossings include a pedestrian underpass that provided access to the railroad from the south side of town. 4. The Boyd Building - 1292 N. 1st St. Built in 1925, the Boyd Building is one of Abilene's premier examples of an early service station. The original station was Gulf Refinery Company, No. 3, and was later taken over by the C. H. Boyd and Sons Tire Co.
5. The Elks Building - 1174 N. 1st St. The Elks Building was built in 1913 to house the Benevolent and Protective Order of the Elks. Lodge 562 existed from 1900 to 1937. The Lodge reorganized in 1955 and closed permanently in 1964. The building was used as a USO Club during WWII. The City of Abilene has owned the building since 1945 and has used it as a City Hall annex and police training facility. The structure's facade, one of the best preserved historic buildings in downtown, is characterized by distinctive brick and masonry work and arched windows. The Building has been restored, renovated and renamed the Elks Art Center (676-3775). It houses the Abilene Preservation League. 6. The Grace - 102 Cypress St. Originally constructed in 1909 by Colonel W. L. Beckham and named for his daughter, Grace. For many years it was Abilene's premier hotel and the first sight seen by railroad passengers as they approached the city. The hotel, originally only three stories, had a fourth floor and a one-story section on the ground floor added in 1924. In 1946 it was remodeled and the named changed to the Drake. The hotel closed in 1973 when its boiler failed. The Grace is listed on the National Register of Historic Places. In 1986, the Abilene Preservation League purchased the hotel in order to preserve it. It was renovated and restored in 1992. 7. Abilene Reporter News - 101 Cypress St. The Reporter News is Abilene's oldest business and was founded in a tent by Charles E. Gilbert in 1881, just a few months after the town was founded. The first copies of the newspaper were printed on a “G Wash” press similar to the one on display at the Abilene Reporter News. The building, although not an historic structure, has a Texas State Historic Marker noting the paper's prominent role in Abilene's growth and development. 8. The Compton Building - 158 Cypress St. Built c. 1923, the Compton Building housed a drugstore and cleaners for many years. The second floor was used for medical offices. The building, after many years of standing vacant, was rehabilitated in 1993 and opened as a restaurant. 9. The Cypress Building - 174 Cypress St. The original Windsor Hotel was built in 1890 and is the oldest commercial building in Abilene. It featured arched openings on the second and third floors and a 16-foot high balcony with ornate iron decoration. The 1997 renovation returned the facade to its original hotel look. 10. The Vera Minter Memorial Park - N. 2nd and Cypress Sts. Minter Park is the site of one of Abilene's first businesses, Fulwiler's livery stable. The beautiful Queen Theater replaced the stable in 1915. The Queen was torn down in 1974 and the property was purchased by the Minter family. The park, honoring Vera Hall Minter for her dedicated community work, was developed after a community fundraising effort. The focal point of the park is the 16-foot high, 34-foot wide waterfall. 11. The Paxton Building - 202 Cypress St. Built by George L. Paxton in 1923 and rented to Gambill Brothers for retail hardware store. Mr. Paxton was President of Citizens National Bank from 1910 to 1934. His name was associated with many of the buildings that were constructed during this period. 12. The Grissom & Popular Buildings - 220 and 242 Cypress St. The Grissom-Popular Building dates to 1925 and housed Grissom's Department store from 1925-1939. The store then moved next door to 220 Cypress and 242 became known as the Popular Building. The buildings still retain some of their historic fabric. 13. The O'Kelley Building - 290 Cypress St. Designed by David S. Castle and Company this building was constructed in 1929 to house the W. G. Waldrop & Company furniture store. Montgomery Ward occupied the building from 1934 to 1959. Many of the original Art Deco architectural features of the building remain intact. 14. The Mims Building - 275 Cypress St. Built in 1926 by W. G. Swenson, George Paxton and H. O. Wooten; the Mims was designed by David S. Castle. This eight-story building was one of two major buildings constructed during the 1920s boom. It was built to house Mim's Department Store coined "West Texas' Finest Store." The building provided office space to many of Abilene's prominent businessman. W. G. Swenson maintained an office on the 7th floor. The building was renovated in 1980. The original windows were replaced, but the building retains much of its original classical detailing and architectural fabric. 15. The Wooten Hotel - 302 Cypress St. The 16-story, 200- room hotel was built in 1930 by wholesale grocer W. O. Wooten. The hotel, designed by David S. Castle, had a ballroom with a balcony overlooking the dance floor. Its height and Art Deco design made the building a local landmark for many years. In 1963, the hotel was converted to apartments and the name was changed to Abilene Towers. The Towers closed in 1999, and the building was renovated in 2004 to house market-rate apartments and retail shops. 16. The Paramount Theatre - 352 Cypress St.
Another David S. Castle landmark, the Paramount opened May 19, 1930, as part of the Wooten Hotel development. The 3-story theatre features Spanish Colonial Revival architecture, Art Deco light fixtures and is best known for the stars and clouds that move across its ceiling. The theatre closed in 1979 and was saved from demolition by local preservation efforts. A complete restoration of the theatre was completed in 1987. The theatre is now operated by a non-profit organization and is a center for classic and art films, and the performing arts (676-9620). 17. The Hilton Hotel (The Windsor) - 401 Pine St. Built in 1927 by the Abilene Hotel Co., which was then owned by one of Abilene's most prominent businessmen. The hotel was leased by Conrad Hilton and was the first hotel to bear his name. It was renamed the Windsor Hotel when Hilton's lease ended in 1945. The Windsor (677-0824) was restored and renovated to offer retirement apartments. The facade and first and second floors, including an exquisite ball room, were restored using David S. Castle's original drawings. 18. The Federal Building - 341 Pine St. The original Federal Building was constructed in 1901 and had a large Victorian bandstand located on the grounds. On September 27, 1927, Charles Lindbergh spoke to a crowd of thousands from the bandstand. A new Federal Building was constructed in 1937. Through local efforts, the original building was saved only to be torn down in 1964 to allow for the expansion of the current facility. 19. The Minter Building - 244 Pine St.
Taylor County's first department store Minter's Dry Goods was built in 1925. The two-story structure with Gothic detailing and terra-cotta facade is one of David S. Castle's finest designs. Minter's was sold in 1974 and closed in 1986. The building is now a cooperative featuring arts and crafts, and gifts of every kind. A restaurant is located on the mezzanine. 20. The McLemore-Bass Building - 216 Pine St. In 1991, the owners and craftsman used historic photographs to restore this business to its original 1930s appearance. The building is on the National Register of Historic Places. 21. The Waldrop / Casa Authentique Building - 201 Walnut St. This building was constructed in 1927 by J. M. Radford and originally housed the Poston-Hemphill Department Store. G. W. Waldrop moved his furniture business to this site in 1934. In 1987, the Waldrops restored the façade to its 1927 appearance. 22. The Wooten Wholesale Grocery (Pfeifer Building) - 101 Walnut St. This structure, built in 1906, served as the headquarters for H. O. Wooten's Wholesale Grocery. Established in 1898, this business was one of Abilene's best known and most important. By 1948, the firm had 14-branch warehouses in West Texas. In 1911, a fire destroyed much of the building and many of the business records. The building was rebuilt the following year. Mr. Wooten was one of the most influential businessmen in the community and the Wooten name was connected to many other developments. The grocery business occupied this site until the 1950s. 23. The T&P Freight Warehouse - 901 North 1st St. Constructed in 1929 to serve as Abilene's freight depot, this warehouse was rehabilitated and reopened in 1999. This building anchors the southwest corner of the historic district and represents the importance of the railroad in Abilene's history. 24. The Alexander Building - 104 Pine St.
Construction on the Alexander Building began in 1925 and was completed in 1927. The seven-story structure was built for Dr. James M. Alexander, a prominent physician. Dr. Alexander practiced in Abilene for more than sixty years and built the Alexander Sanitarium, which was one of the first hospitals in West Texas. This building was the first “high rise” in Abilene and housed many prominent physicians, attorneys, and other professionals. The construction of this building, also designed by David S. Castle, marked the beginning of a construction boom in mid-20s Abilene. While not located on the walking tour this historic building is located within a short drive from downtown (see map). Listed on the National Register of Historic Places, the Old Weather Bureau was constructed in 1909 to serve as the area center for the US Weather Bureau. It continued to do so until area weather services were relocated to the airport. Born in Constantine, Michigan in 1884, David Sharon Castle created the firm that would dominate architectural design in the Abilene region throughout most of the first half of the 20th century. Castle left home at age 15 and made his way to Chicago, Illinois. There he held several odd jobs until he eventually worked his way through night school at the Lewis Institute for two and a half years and later graduated from the Armour Institute (now Illinois Institute of Technology). He moved to Texas in 1910 and in 1913 gained employment from Fort Worth architect M. L. Waller. By 1914, Castle had moved to Abilene and started his own firm, David S. Castle & Company. Castle's company supervised the construction of many of the 1920s landmarks of downtown, such as the Wooten Hotel, the Windsor Hotel, the Mims Building, the Federal Building, and the Paramount Theatre among others. His firm also planned two remodeling projects on the Hotel Grace, and designed buildings at all three Abilene Universities, as well in many other towns in the region. T&P Passanger Depot Abilene "Convention & Vistors Bureau"
Railroad Express Agency Building "Candies by Vletas"